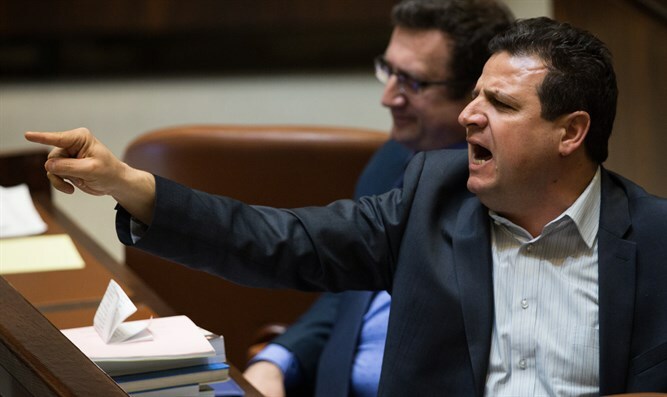 Joint Arab List Chaiman MK Ayman Odeh spoke at the Knesset plenum before the vote on the law to dissolve the 20th Knesset. "If the government of the 20th Knesset were to be summed up, it was the government of racism and incitement," said Odeh. "A government that used its political power to incite against an entire population. This is all part of the campaign to delegitimize the Arab citizens. "Netanyahu understands this very well - when the Joint List increases its power - we're threatening to topple the extreme right wing and racist government. Netanyahu understood this in the 1990s, and in 2015 in his incitement campaign. Netanyahu understood this throughout his term. "This is the story of the 2019 elections - on the one hand, hatred, occupation, persecution of all those who oppose right-wing policies, running after nonprofit organizations, reducing the democratic space, annexation, racist legislation, oppression, division, and discrimination. Above all, the Nationality Law, the law of Jewish superiority, the tyranny of the majority that seeks to destroy the minority, the law that enshrines racism, discrimination, and separation in the book of laws. "On the other hand, our vision is an Arab-Jewish partnership to end the occupation, social and political justice and equality for all citizens. The next four months are a hope to realize this vision." MK Odeh added, "So yes, Netanyahu, we, the Arab citizens, will flock to the polls in droves, and we'll increase our strength, now more than ever. Anyone who wants to divide and rule between Jews and Arabs or between Arabs and Arabs strengthens Netanyahu. They want us weak and separate; we will be strong and unified, in the face of nationalism - we'll talk peace and equality, we'll use our power to overthrow the fascist Right. So choose: Apartheid or democracy."